Alison Neale performing at Fleet Jazz Club. ALLISON NEALE, the American born altoist, beautifully crafts lines that evoke the spirit of Paul Desmond and Art Pepper with whom she has a particular affinity. As a strong advocate of the melodic West Coast style she has performed alongside leading international artists such as Adelaide Hall and Bud Shank and more recently tenorist Scott Hamilton as well as featuring in both the John Dankworth ‘Generations‘ Band and the ‘Back to Basie’ Orchestra. 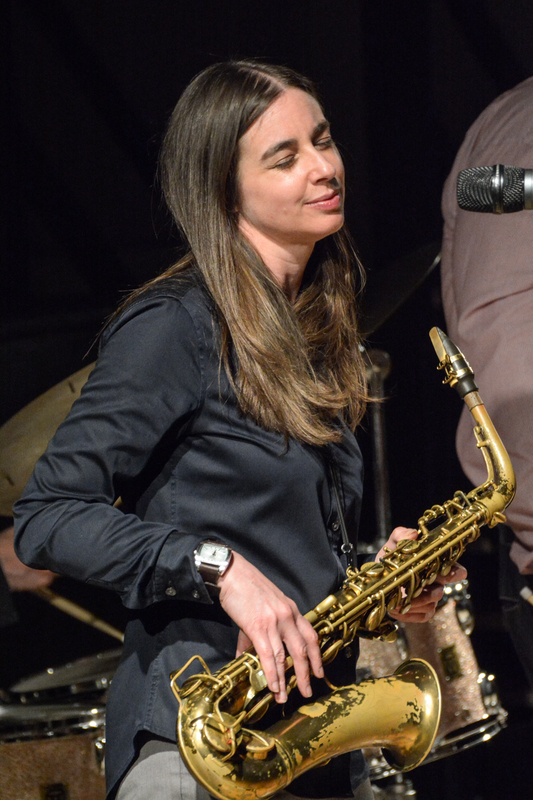 She frequently tours the UK with her current Quartet, which also features acclaimed jazz pianist Leon Greening, bassist Julian Bury and drummer Steve Brown and has two CDs to her name: ‘Melody Express’ with guitarist Dave Cliff and ‘Blue Concept’ with trumpeter Gary Kavanagh , both on 33 Records. Her latest CD, ‘I Wished on the Moon’, released in 2015 on the Trio Records label, features the quartet as well as Milt Jackson influenced vibraphonist Nat Steele. Born in the US when her British father was working for Boeing in Seattle, Allison returned to the UK as a young child. Her father’s love of jazz meant that the West Coast followed her back to England—Stan Getz, Paul Desmond, Art Pepper and Lee Konitz. She’s still a major fan of West Coast saxophonists and also cites a diverse array of players including Frank Wess, John Coltrane and Wes Montgomery. Jazz writer Dave Gelly described her alto tone as ‘so light and airy that it melts at the edges.’ It’s a memorable turn of phrase, but it would be a mistake to infer that there’s any hint of weakness or frippery in her playing. Neale swings—if she didn’t she’d sound very out of place alongside her fellow musicians—and her playing exudes a quiet confidence. She’s confident in her approach to recording as well—‘the old fashioned way’ as she puts it, one take, straight to tape.